Military academies are some of the most revered institutions in the country. Many only take in around 4,000 students in total. Among that small number of students, even fewer compete in varsity athletics. 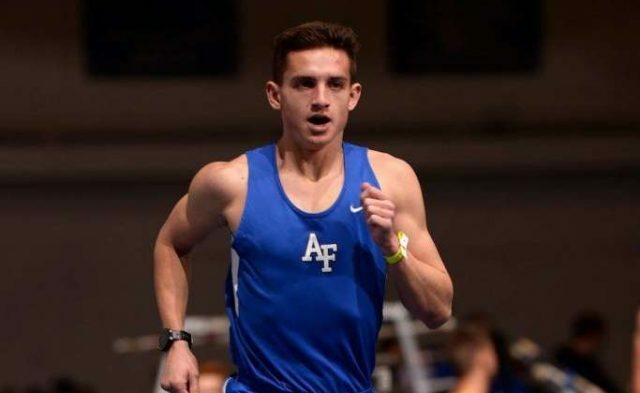 Meet three local athletes now running at the United States’ military academies. Like many high school athletes, Dan Horoho did not expect to fall in love with running. He started running to get in shape for lacrosse. But after one season of cross country and indoor track, he was hooked — so much so that he didn’t bother with lacrosse. A 2017 Centreville graduate, Horoho made the Virginia state meet six times and was all-state in the 3,200 meters and 1,600 meters. This fall, Horoho will be facing new challenges as he joins the cross country and track teams at the U.S. Military Academy at West Point. Choosing West Point was simple — his dad was in the Army — and Horoho was always drawn to the idea of following his father’s military legacy. After watching the Army-Navy football game on TV, Horoho says he started thinking seriously about attending West Point. The past two summers, he attended West Point’s running camp program, and last year sealed the deal. While college athletes struggle to balance training and school, Horoho says he’s not worried about that happening at West Point, where athletics are more heavily integrated into every student’s normal schedule. If his running commitments become larger than anticipated, Horoho says he will ultimately prioritize his classes above all else. “I’m there to learn,” he says. Horoho had not started his training as of late June, but he had his own set of expectations for West Point. Horoho has the added advantage of knowing several of the West Point runners already. Briana Broccoli already has one year of military academy running under her belt. A sophomore at the Merchant Marine Academy, Broccoli ran one season with the cross country team but has now set her eyes on longer races, like half and full marathons. While attending Bishop O’Connell High School in Arlington, Broccoli loved competing in cross country. “I ran in high school under coach [Cindy] Walls for four years. It was a wonderful experience. It was awesome so I decided I wanted to do it in college,” she says. Broccoli managed to win several accolades during her first season, including Skyline Conference Rookie of the Year and an Eastern College Athletic Conference Metro Rookie of the Week award. But despite her successes both in the classroom and on the race course, Broccoli has no plans to return to the cross country team this year. “Coach [David Lawrence] is a great guy. He’s awesome. But unfortunately, he has this rule where you can’t do cross country without track and I do not want to be in season all year doing indoor and outdoor track because I am not a track person at all,” she explains. Tim Ward, a 2015 graduate of West Springfield High School, has a story similar to both Horoho and Broccoli’s. Like Horoho, Ward’s eagerness to join the military came from his family legacy. “I’m a military brat. My dad was in the Air Force,” he says. Of course, education is also important to him, as he hopes to become either a pilot or an Air Force lawyer after graduating with a degree in legal studies. Ward recalls the first few days on the team as the most difficult. Like Broccoli, Ward agrees that incoming military athletes are at somewhat of a disadvantage due to basic cadet training during the summer. And the academy, near Colorado Springs, sits at 7,000 feet, adding altitude acclimation to the challenge. Ward does not see this disadvantage to freshmen as a negative, but rather as a different way of introducing new athletes to the program. “The Air Force team puts a heavy emphasis on seniority,” he says. “I think [the two methods are] both good.”Ward certainly notices a distinct difference between high school and military running programs. “The mileage step-up can be a problem for some people,” he admits. Ward also notices a distinct difference in the frequency of meets. “You have lots of opportunities to race in high school as opposed to college,” he says. That means nailing each race becomes that much more important at the college level.